When deciding on a wine with food, most people go through some form of a selection process. They try to somehow match the wine to their personal preference (white vs. red), their mood, and their food. The latter is known as ‘food-wine matching’ (or ‘pairing’). A well-paired meal can improve the dining experience whereas the opposite is true for a poorly paired meal. This is fact. Many approaches are attempted, like sticking to your comfort zone (e.g. Rioja, Chardonnay), asking the waiter or sommelier, tasting what’s open or accessible, delegating the responsibility, selecting on price, and my least favourite of all, choosing by food colour (white wine with chicken or fish, red wine with meat). Wrong, wrong, wrong! But I didn’t realise how wrong this was either until recently when I began talks with a startup called Delipair, who claimed to have solved this age-old problem of matching food and wine. The founder and CEO, Konrad Jagodzinski is a wine enthusiast turned tech startup entrepreneur. Through tonnes of research and laboratory work, Konrad developed a science-based solution for matching wines, and made it accessible to anyone at delipair.com (currently free). The basics of how it works: The aroma compounds of food ingredients and the cooking method are matched to aromatic fingerprints developed in their lab, resulting in the right recommendations based on the pairing points that have the strongest aromatic bond. Generating wine recommendations is much easier, though. Just paste a link to any recipe from the web into the search tool, and Delipair’s algorithm will simplify your predicament by recommending just three of the best options – based on science. I began working with Konrad to help grow his business, so I naturally wanted to know just how much impact a good pairing can have. We arranged dinner at The Golden Hind (a 100+ year old Fish & Chips restaurant on Marylebone Lane, London). They let you bring your own booze (BYOB). For the wine recommendation, we pasted a link to one of Jamie Oliver’s fish & chips recipes into Delipair’s search tool, and the middle recommendation was a New Zealand Sauvignon Blanc (here’s how the recommendations are displayed). 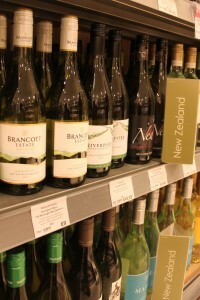 Before dinner, I chose the wine off the shelf at Marks & Spencer, Oxford Street. A short walk later we were seated at the Golden Hind with the wine on ice. After a sip, I was done – I didn’t like the wine. But I was there to test the effectiveness of Delipair. After a bite of fish, the next sip tasted different – not unpleasant. After another bite and sip, I was enjoying my best Fish & Chips experience, ever. I like that I’ve discovered something that will improve my meals with wine. But what I love about this tech startup is how it addresses an old, everyday, ongoing problem experienced by most of us. We fumble, gamble, fluke and blag our way through the wine selection. No more. Delipair has delivered a simple way for you to solve that problem with a click, and solve it well. So why not upgrade our experiences? Try pairing any recipe. Better still, experience the real thing by making a meal out of it.